While that description belongs to someone generally seen sporting a red cape, it’s nonetheless true that paramedics do some pretty amazing things in the course of a day’s work, without having to show up for work wearing blue tights. 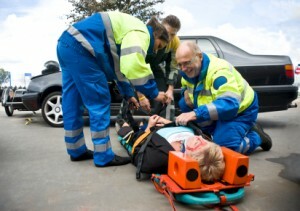 However, the Bureau of Labor Statistics forecasts that, thanks to the number of aging baby boomers who will need more emergency care as they grow older, and the national trend toward hiring paid professional paramedics rather than volunteers, the growth rate for EMTs will be 19% from 2006-2016. That means that more and more paramedics will be exploring the options that their education offers in the field of emergency training. But it doesn’t start with the training. Some of the traits that make a good paramedic show up long before the 911 call comes through. A paramedic needs to stay calm under pressure because every minute may be critical in emergency situations. A paramedic should have the training and the composure to assess the nature of the emergency and decide what course of action is called for based on the patient’s symptoms. Should the patient be moved? Is it necessary to resuscitate the patient? Does a wound need a dressing? Paramedics need to be physically fit, too. A paramedic team transporting a child who’s been stung by bees and needs emergency treatment may not be challenged by the lifting, but what happens when the person in the gurney is a former NFL linebacker that’s packed on some extra pounds over the years? In an instance like this, a paramedics’ physical stamina is key to the transport. Oh, and how’s your driving, by the way? An ambulance paramedic needs to be a safe driver who has knowledge of the Highway Code, and who knows how fast to drive while obeying necessary traffic laws in order to avoid putting other drivers in danger. Due to the hectic nature of a paramedic’s job, medics can’t count on getting all their weekends off, or being home on all the holidays, either. This can add stress to what is already a stressful profession. Can you handle dealing with one of the most stressful jobs in the country? Because according to CNBC.com, Career Cast ranked Emergency Medical Technicians and paramedics the ninth most stressful occupation in America. It takes a very special person to thrive in this environment, and for the ones who are suited to be paramedics, this profession brings a unique kind of job satisfaction that can’t be achieved by anything else. Are you a team player? Because a paramedic is often working in the company of law enforcement professionals and firefighters to handle the ramifications of a car wreck or four-alarm fires. In such an emergency setting, it is vital that each person recognizes his or her role and knows the boundaries, respecting the training and authority of the others on the scene, just as the paramedic’s significance needs to be recognized by others. The same paramedic who is cool under pressure needs to be diligent and methodical when taking care of routine tasks. Today it’s a five-car accident on a snowy road, but tomorrow it might be transporting an elderly patient from the nursing home to the hospital for dialysis. That means that the best paramedics can handle the emotional roller-coaster ride of Monday’s crisis turning into Tuesday’s sit and wait. Some medic job description tasks involve basic EMT housekeeping that has nothing to do with adrenaline and everything to do with organization. There is always paperwork to fill out. The equipment has to be routinely checked to confirm that it’s ready to handle the next emergency. There is one more vital trait that doesn’t show up in the testing but is key to making a successful paramedic. Can you reassure a frightened child who has had a bad fall and whose mother is in hysterics? Can you be patient and firm with the drunken homeless man that doesn’t understand why he can’t light up a cigarette near an oxygen tank? A paramedic might have all the skills that can be learned in class, but all that training may be of no use if he or she can’t display compassion in situations where people aren’t at their best. So you’re still up for it, eh? Even if you’re wearing safety boots and a uniform rather than a flowing red cape, you likely feel pretty great about the career choice you’ve made. Now, the challenge is deciding what kind of paramedic you want to be. You’ll be glad to know that you’ve selected a versatile profession with a number of options to choose from. By now, you’ve noticed that paramedic job descriptions aren’t meant for people who want to sit behind a desk waiting for the clock to strike 5:00 pm. Paramedics are mobile, but not all emergency vehicles are hurtling down the highway. Look up in the sky: it’s a bird, it’s a plane, it’s—a helicopter, with a flight paramedic on board. Helicopters are a familiar sight in the sky overhead when there’s been a serious traffic accident on the highway. They are also used to relay patients from one facility to another when more specialized care is needed and there’s no time to waste. Another form of air ambulance is the fixed wing aircraft, which is used to transport a patient who is in stable, rather than critical condition, over a longer distance. This medical aircraft environment is staffed with a paramedic as well as a nurse, or perhaps even a doctor. The two professions work well in tandem, as paramedics are familiar with the beyond-the-hospital emergency setting, while nurses and doctors are adept at providing concentrated care over a longer period of time. What Are Tactical Paramedic Jobs? As emergency medicine becomes more and more integrated into the kind of situations that turn into breaking news, the Tactical EMS (TEMS) has become more common. The tactical paramedic pairs with Special Weapons and Tactics (SWAT) teams, and may even be authorized to carry weapons. TEMS paramedics may be SWAT officers with paramedic or EMT training, or maybe paramedics who assist when a SWAT team is sent out in response to a crisis. The need for tactical medics is increasing, although at this point, there are not as many tactical paramedics available as are needed to meet society’s demand. What Are Industrial Paramedic Jobs? 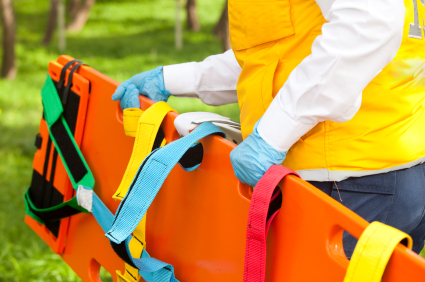 Industrial workplaces such as oilrigs, factories, canneries, and mines need paramedics working on site to handle the variety of medical emergencies that may arise. Industrial paramedics may also work in dangerous locations in remote areas. Remote paramedic jobs can command a higher salary to compensate for the work environment. What Are Critical Care Paramedic Jobs? The critical care paramedic is a paramedic that has received training in pathophysiology, pharmacology, interpretation of laboratory values and routine diagnostic images, ventilator management, aortic balloon pump management, and air medical concepts. These paramedics are authorized to administer more medications than the regular paramedic because they have been trained in standard aspects of critical care assessment and management. The world of the firefighter overlaps with that of the paramedic, as metropolitan fire departments increasingly require their personnel to have emergency service technician certification. In many cases, the firefighters themselves are actually paramedics. The firefighter paramedic is first a firefighter who goes into paramedic mode when the medical crisis becomes paramount. What is a Search and Rescue Paramedic? You’ve seen it on the news: campers lost in the wilderness, mountain climbers lost in an avalanche. The search and rescue team that’s assigned to find these people is made up of people who are required to have their EMT certification, and park rangers are often EMTS; in fact, wilderness paramedics, also known as the search and rescue (SAR) teams, are often led by park rangers. Urban search and rescue teams (USAR) work with fire departments and ambulance services. The Federal Emergency Management Agency (FEMA) has 25 federally funded USAR teams. As you can see, the paramedic job description is a gateway to a wide-ranging career in medicine. In addition to the opportunities described in this article, paramedics often become instructors for recertification in their own field, as well as training to be registered nurses and physicians. According to the U.S. Bureau of Labor and Statistics, the unemployment rate for paramedics is 3.1%. If you’re looking for a field where there is going to continue to be a need, paramedic is a safe bet for steady work. Pay is an important factor in deciding employment choices, too. A paramedic in Nevada, which offers the highest pay rate, will earn $35.45 an hour. However, if you’re in Oklahoma, your pay is $14.77 an hour. Click here for more information on the best and worst states for paramedic salaries. Whatever branch of paramedicine you choose, you can be confident in your employment prospects, as the field is expected to increase 33% by 2020. So who needs a red cape anyway? As a paramedic, you’re poised and ready for a super job with super prospects. Remember that Paramedic Training Spot is your #1 option for finding the best and most relevant information pertaining to how you can become a paramedic.